Located within easy walking distance of the Festival gates, these 10 RV spots offer a leveled gravel 20’ by 60’ RV parking area. Cost is $50 per weekend n addition to the campground entry fee. RV sites have limited availability. 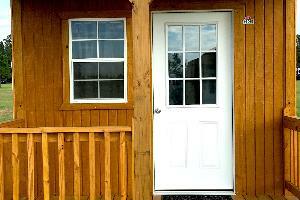 Located in the Family Camping area, we offer 5 rustic cabins available for rent. 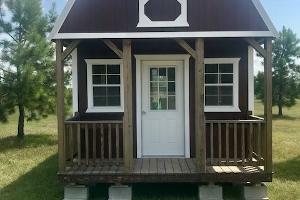 Cabins are furnished with up to four cots (bedding and pillows are not provided), a night stand, lighting, air conditioning and a private Port-O-Let. Doors and windows can be locked for security and each cabin has its own personal parking spot and an adjacent private portable toilet. Book by the Tuesday prior to your visit and receive free campground entry for one vehicle. Located in the Revels Camping area are 50 furnished tents offering luxury tent camping for the discriminating camper with two options for camping arrangements. 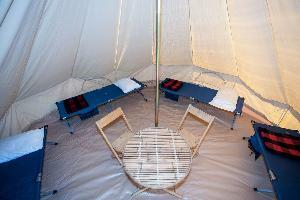 We offer Bed Tents with either two twin or one queen sized mattress and Cot Tents with two - four cots. Book by the Tuesday prior to your visit and receive free campground entry for one vehicle. Welcome to the Fields of New Market Campground! We have 5 cabins available per weekend for rental. They are located close to the showers in the open Family Camping Area. 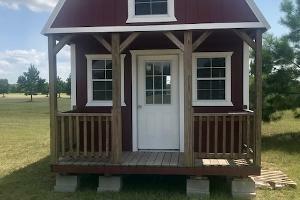 We have 1 cabin that sleeps 6 available per weekend for rental. 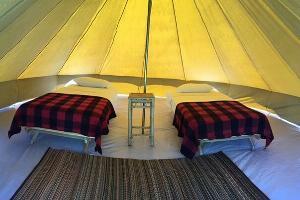 It is located close to the showers in the open Family Camping Area. We have 1 cabin that sleeps 8 available per weekend for rental. 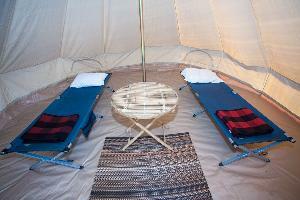 It is located close to the showers in the open Family Camping Area. 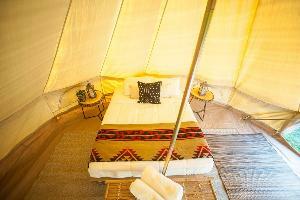 Located in the Revels Camping area are 20 furnished tents offering luxury tent camping for the discriminating camper with two options for camping arrangements. Reserved RV Pad Sites allow you to show up when you want without having to search the campground to find a spot to park. The Fields of New Market offers a number of amenities to make your stay as fun and comfortable as possible. 2 General Stores have almost everything you might have forgotten to bring yourself. The Drag-on Inn is located right at the front entrance of the campground and the Drag-On Buy is located in the Revels Campground across from the bonfire pit. Full Service Toilets and Shower House are located near the front entrance. Showers cost $1 per minute (tokens only) and tokens are available for purchase at the Drag-On Inn. Body wash and towels are also available at an additional cost at the showers. Shower house hours are Fridays 5 pm to 10 pm, Saturdays 7 am to 10 pm, and Sundays 7 am to 1 pm. Thanksgiving weekend hours are Friday and Saturday 7 am to 10 pm and Sunday 7 am to 1 pm. Campground Shuttle Service is available to take you directly to and from the Festival gates. $4.00 per person each way. Provisioner’s Pavilion is located directly across from the bonfire pit in the Revels Camping area. Here you will find the Drag-On Buy general store, food and beverage services, and other amenities. Potable Water stations are located near the front gates. Portable Restrooms are placed at convenient locations throughout the campground. Private port-o-let rentals are available. They can be reserved in advance by calling 936-577-1152. RV Dump Stations are provided free of charge and are located near the front gates of the campground. HOLD HARMLESS: Cabin/Tent guest acknowledges and understands that each and every guest, or guardian, is solely responsible for any accident or injury to any person while in-residence, and that the Owner accepts NO legal or financial responsibility. Cabin guests, and guardians, assume all risk of injury or other loss resulting from any recreational activity and will hold the Owner harmless with respect thereto. Cabin/Tent guest(s) hereby agrees to indemnify and hold cabin/tent referred to as those managed by KMM Group, LLC and/or the property owners (KMM Group, LLC or Troy and Laura Wilkie) or its property management harmless from any and all claims, including those of third parties, arising out of or in any way a result of the cabin/tent guest(s) use of the premises or items therein.